year-on-year increase in profits of 160% in 2016. The peer-to-peer betting exchange, founded in 2008, reported its third consecutive year of growth. Total pre-tax profits were up 160% to £13.7 million (£3.2 million of which came from share-based payments) in 2016, from £5.2 million in 2015. In comparison, total pre-tax profits were £316,000 in 2014. Revenue was up 144% in 2016 to £25.4 million, from £10.4 million in 2015. “Our mission is clear; we are striving to establish ourselves as a top-tier technology company,” said CEO Jason Trost. “We will continue to further develop our product to deliver a unique and fair trading experience by offering superior technology and industry-leading commission rates and will explore moving into new regulated markets to increase our customer base,” he said. 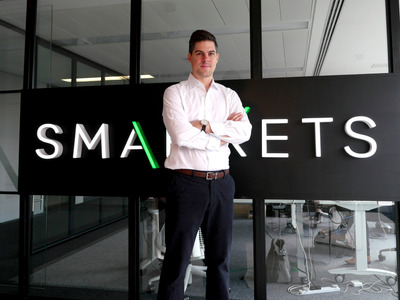 Smarkets is headquartered in London, but opened a US office in California in February, prompted by the UK’s Brexit vote. Trost said last year he ultimately expects the company’s main focus to shift from the UK to the US. The company now has close to 200,000 users. Average active monthly traders in 2016 was 24,958, up 118% from 2015’s 11,429. Trading volume was also up 141% to more than £2.6 billion as users made bets on sporting events as well as political outcomes, such as the UK’s EU Referendum and the US presidential election. In 2016, Smarkets made the top five on the Sunday Times Tech Track 100 and Deloitte Fast 50 lists.